If you were to ask people what they knew about the city of Barranquilla, which is located on the northern Caribbean coast of Colombia, the answer is likely to be very little. Some may know it for the Carnival, the second largest in the world behind Rio de Janeiro, while others may recognise it as the birthplace of singer Shakira or actress Sofia Vergara. Some of the more cultured may know it as the city where the legendary author Gabriel Garcia Marquez was based for much of his life. However, I can guarantee that nobody will have heard of Barranquilla for its tennis. However, last night saw Barranquilla join locations, including Meersbusch, Dallas and Scheveningen, to have seen match fixing scandals in ATP Challenger Tour matches in the past 18 months. While this article will focus predominantly on the match between Nicolas Kicker and Giovanni Lapentti, it will also touch on another match from Barranquilla between Facundo Mena and Patricio Heras. Nicolas Kicker is a 23-year old player from Argentina, ranked at #171 in the world. He has three ITF titles in 2015 and ten in total in the past three years. Before heading to Barranquilla, he had reached back-to-back Challenger finals in Biella and Todi, which marked a real breakthrough for his career having previously failed to pass the second round at that level. Going into his match against the veteran Ecuadorian, Giovanni Lapentti, he was the eighth seed and might even have been mentioned as a dark horse for a good run again. 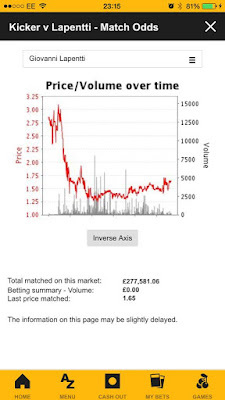 As the pre-match odds show, he was priced at 1.53, which relates to an implied probability of around 65% of winning the match. There was nothing suspicious about these pre-match odds. It has been mentioned that Kicker might have been a fraction short based on data, but in general, these odds look to be about right. The match did not start particularly well for Nicolas Kicker as he went down an early break at *2-1, but he was able to break back straight away in a long game. He then held to love and broke Lapentti again in another long game and held serve to go 5-2* ahead. 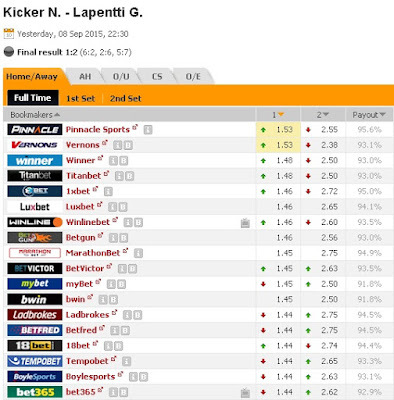 At this stage, you would expect Kicker to be pushing toward a price of around 1.25. However, as we can see, this was far from the case. 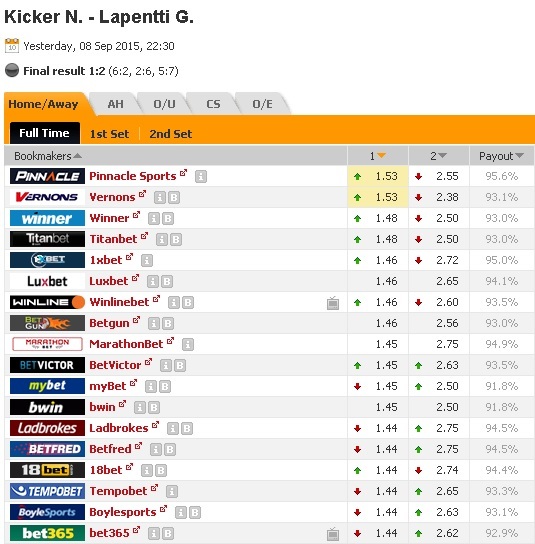 Rather than being a strong favourite, for some bizarre reason, Nicolas Kicker has actually drifted way out in the betting to a price of 3.3, implying a probability of just 30.3% of winning the match. For a player that was 65% to win before the start, it is entirely nonsensical for him to now be only 30% to win the match, despite being ahead by a break in the opening set. Unless there is a major injury concern, this is highly suspicious. However, Lapentti would break and consolidate to take a 4-2* lead in the second set by which time the market had decided how the match was going to play out. 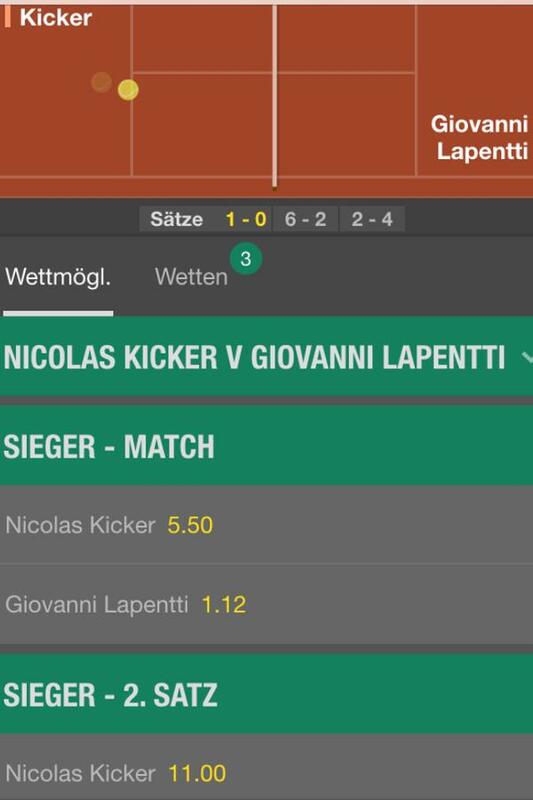 At this stage, we can see that Bet365, who would have been reflecting the Betfair movements had Giovanni Lapentti at 1.12 to win the match, implying an 89% chance. Given the initial match price and the fact that he was still down a set, this is just farcical. Indeed, despite only being down a single break, Nicolas Kicker is rated as having just a 9.1% chance of winning the second set. Given that at this stage of the match, he had broken the Lapentti serve three times in seven games and had only been broken twice himself, this is quite simply beyond belief. 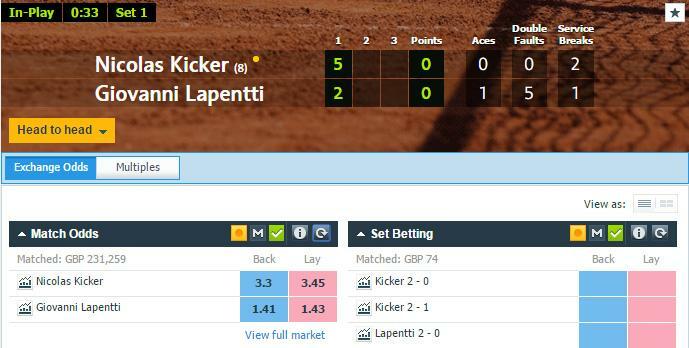 To the surprise of nobody that was following the match, Lapentti won the second set and went on and won the match in the third set. The fact that Lapentti was playing so poorly, particularly in the third set, actually made this all the more obvious to watch. Indeed, you almost get the impression late on in the third set that Lapentti, who was on the end of another questionable match earlier in the year against Jimmy Wang, had figured out what Kicker was doing and did not quite know what to do. The clip below from Kicker's service game at 4-4 is a perfect example. Kicker throws in two double faults to bring it to deuce, but Lapentti then puts one into the net and then hammers a return wide to the frustration of the Argentinean. In the decisive game at 5-5, Kicker loops his first serve in for Lapentti to hit an easy return winner on the first point. The second point sees a first serve that almost bounces before it reaches the net followed by an unforced error into the net during the rally.The third point is an almost carbon-copy backhand into the net and it was finished off by a decent point by Lapentti, who by this stage, almost looked disinterested as he knew what was happening. I would stress at this stage that, while he may have gained an idea toward the end of what was happening, there is no evidence to suggest that Giovanni Lapentti had any part in any wrongdoing in this match. The finger is pointed at Nicolas Kicker and Kicker only. 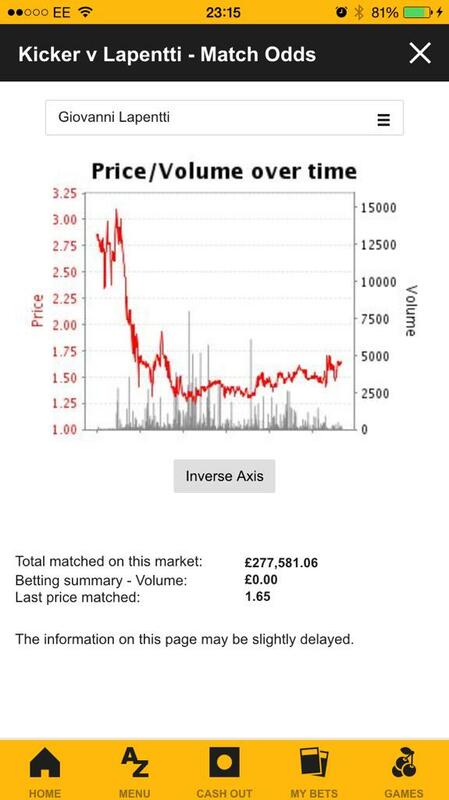 By the end of the match, there was almost £700,000 matched on Betfair on the match market. As with all of these suspicious matches, there is virtually no way to explain the movement of the betting odds other than that someone knew the outcome of the match before it happened. An injury might have moved the odds to an extent, but there was no indication of any injury. The full video of the match is below, so you can check it out yourself. I mentioned another questionable match earlier as well - Facundo Mena against Patricio Heras. This was also in Barranquilla. Facundo Mena started as a slight favourite in this match and there appeared to be little between them as they reached a first set TB. Patricio Heras went up a mini-break, but this marked the influx of a large sum of money into the market backing Facundo Mena. 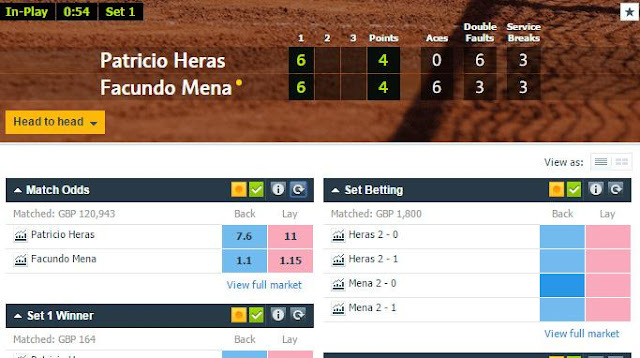 As the image below shows, by the time that Mena had recovered the mini-break and the score was 4-4, Mena had been backed into a price of 1.1, implying a 91.0% chance of winning the match. This seems unlikely given it was not far off a 50-50 match at the start. Facundo Mena would win the tiebreak and would not lose another game, eventually winning the match 7-6, 6-0. However, there does not seem to be a stream available for this match, so it is difficult to tell whether there was an injury concern around Heras during this tiebreak. It has been suggested that Heras took a MTO between sets, which suggests the presence of an injury. However, even if this is the case, given there were no pictures of the match, it seems strange that someone with large amounts of cash just happened to be live at this match in Barranquilla. Is it plausible? Just about. Is it likely? Maybe. However, there is probably not enough evidence to say for certain that the match was fixed. Instead, it must be filed in the highly suspicious pile for now. The concern for tennis is that the Challenger Tour is simply becoming a hive for match fixing, whether it be obvious fixes like this, more sophisticated fixes that are tougher to detect or simply spot fixing. As each blatant fix passes without the player(s) involved being sanctioned, the temptation for other players to fix matches grows. If they know that nothing will happened even if the fix is so obvious, what is there to put players off fixing matches? Patricio Heras withdrew from the doubles with a left arm injury lending some credence to the theory that he was actually injured during his match against Facundo Mena. 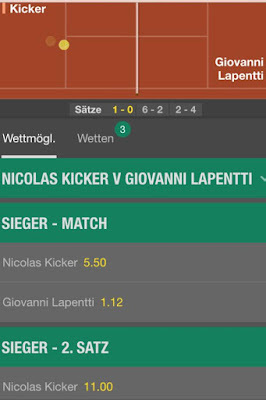 I lost 500 € betting on Nicolas Kicker. If I see him in real life, I am pretty sure I will get my losses back. You had more on Kicker than he would have earned for winning this match. Do you see how ridiculously stupid that is? Great article, Ian. I don't think anything will top what went down in Dallas, but this was for sure a fix. Ever thought of doing this for soccer matches, as well? Do I have any chance to get my money back? My bet has had never a chance. Anyone who bets on Challenger tournaments deserves what they get. The players are playing for less than $1000 many times and knuckleheads think they are trying to win. Talk about moronic.